Why is the World the way it is today? How far can we anticipate the Future? "We study the past to understand the present; we understand the present to guide the future." "How can we understand our present or glimpse our future if we cannot understand our past? History is not the story of strangers, aliens from another realm; it is the story of us had we been born a little earlier." Why did people live in tribes and city states in the distant past? What changes led to Human Beings - whose ancestors had lived in tribes and city states - living in future in the feudal monarchies and dynastic kingdoms and empires of "Middle Ages" Europe? Why do people tend to live in republics and constitutional monarchies today? What changes have led to Human Beings - whose ancestors had lived in feudal monarchies and dynastic kingdoms and empires - living, at present, in republics and constitutional monarchies? How far is it possible to realistically attempt to anticipate, plan, be better prepared for or shape the future? … Of this one mind, History is the record. Of this mind the events of history are the work. Its constitution is illustrated by the entire series of days. Man is explicable by nothing less than all his history. Without hurry, without rest, the human spirit goes forth from the beginning to embody every faculty, every thought, every emotion which belongs to it, in appropriate events. But always the thought is prior to the fact. All the facts of history preexist in the mind as laws. Each law in turn is made by circumstances predominant, and the limits of nature give power to but one at a time. How, then, to set about gaining an appreciation of human nature??? Ralph Waldo Emerson, in his private journals written the eighteen-twenties, seems to have accepted a comparable "Tripartism". Buddhism and Hinduism (also more properly known as Vedanta), are generally considered by Westerners to be particularly philosophical. Like water on a lotus leaf, or a mustard seed on the point of a needle, he who does not cling to sensual pleasures - him do I call a holy man. He who in this very life realizes for himself the end of suffering, who has laid aside the burden and become emancipated - him do I call a holy man. He who has profound knowledge, who is wise, skilled in discerning the right or wrong path, and has reached the highest goal - him do I call a holy man. He who holds aloof from householders and ascetics alike, and wanders about with no fixed abode and but few wants - him do I call a holy man. He who has renounced violence towards all living beings, weak or strong, who neither kills nor causes others to kill - him do I call a holy man. He who is friendly amidst the hostile, peaceful amidst the violent, and unattached amidst the attached - him do I call a holy man. He whose lust and hatred, pride and hypocrisy have fallen off like a mustard seed from the point of a needle - him do I call a holy man. …the pleasures that come from the world bear in them sorrows to come. They come and they go, they are transient: not in them do the wise find joy. But he who on this earth, before his departure, can endure the storms of desire and wrath, this man is a Yogi, this man has joy. He has inner joy, he has inner gladness, and he has found inner Light. This Yogi attains the Nirvana of Brahman: he is one with God and goes unto God. Holy men reach the Nirvana of Brahman: their sins are no more, their doubts are gone, their soul is in harmony, their joy is in the good of all. Because the peace of God is with them whose mind and soul are in harmony, who are free from desire and wrath, who know their own soul. The Parable of the Sower is, perhaps, the most explicitly "Enlightenment" related teaching of Jesus!!! It is possible to detect a suggestion of "Tripartism" in this teaching. "Listen! A farmer went out to sow his seed. As he was scattering the seed, some fell along the path, and the birds came and ate it up. Some fell on rocky places, where it did not have much soil. It sprang up quickly, because the soil was shallow. But when the sun came up, the plants were scorched, and they withered because they had no root. Other seed fell among thorns, which grew up and choked the plants, so that they did not bear grain. Still other seed fell on good soil. It came up, grew and produced a crop, some multiplying thirty, some sixty, some a hundred times." … Then Jesus said to them, "Don't you understand this parable? How then will you understand any parable? The farmer sows the word. Some people are like seed along the path, where the word is sown. As soon as they hear it, Satan comes and takes away the word that was sown in them. Others, like seed sown on rocky places, hear the word and at once receive it with joy. But since they have no root, they last only a short time. When trouble or persecution comes because of the word, they quickly fall away. Still others, like seed sown among thorns, hear the word; but the worries of this life, the deceitfulness of wealth and the desires for other things come in and choke the word, making it unfruitful. Others, like seed sown on good soil, hear the word, accept it, and produce a crop - some thirty, some sixty, some a hundred times what was sown. 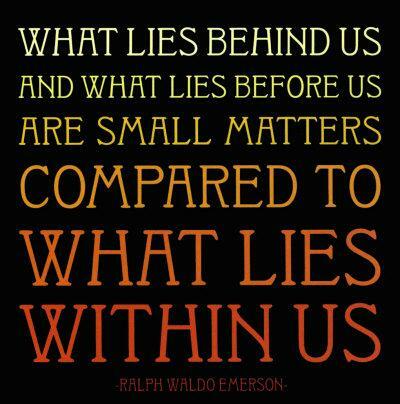 Plato, who lived some four centuries B.C., was a pupil and friend of the greek philosopher Socrates. Amongst the many works attributed to Plato's authorship is his "The Republic" wherein is set out a series of discourses that allegedly took place between Socrates and a number of other persons who variously arrived and departed as the discussions continued. Whilst Human Nature is undoubtedly highly complex we surely have reason to accept that, alongside other features, "what we essentially are" exhibits a discernible "Honesty, Manhood, Good Fellowship" Tripartism. From the late eighteen-twenties Ralph Waldo Emerson developed a thorough enthusiasm for an approach to Metaphysics outlined by a French philosopher named Victor Cousin: an enthusiasm that was to remain with him for several years. "I have been reading 7 or 8 lectures of Cousin - in the first of three vols. of his philosophy. A master of history, an epic he makes of man & of the world - & excels all men in giving effect, yea, éclat to a metaphysical theory. Have you not read it? tis good reading - well worth the time - clients or no clients." We must begin with seeking the essential elements of humanity, and proceed by deriving from the nature of these elements their fundamental relations, and from these the laws of their development; and finally we must go to history and ask if it confirms or rejects our results. If it confirms them, if experience reproduces the speculations of thought, it will follow in the first place, that we have entered upon a path which leads somewhere, ... and, in the second place, we should no longer have systems, schools, and epochs merely, in juxtaposition in space, and succession in time, - a simple chronology; but that we should have a chronology in a frame superior to its own. History would no longer be a series of incoherent words, succeeding each other in a certain order we know not why; it would become an intelligible phrase in which all the words, presenting some idea, would form together one whole, which would completely express some definite meaning. Cousin's approach became seriously influential in the intellectually engaged circles of the USA of the eighteen-thirties. Emerson continued to be under the formative influence of Victor Cousin, to some degree or other, for some six or seven years after 1829. He eventually became prepared to move somewhat away from Cousin's views having developed an adapted theory that was more so his own. Emerson had come to see particular importance to a rounded appreciation of Human biographical experience to a full understanding of History. Could a "Philosophy of History" ~ related to Human Nature ~ be reliable? If we can accept that everyone [regardless of gender], to some extent or other, has capacities for Honesty, "Manhood" and Good Fellowship we can further tend to accept that such characteristics would be suited to individuals functioning as members of such social groups as tribes or other communities such as city states. Individuals might, more often than not, be honest and somewhat spiritual, be prepared - should circumstances require it - to help to defend their tribe or city state, and also tend to enter into social and personal relationships and engage in productive activity related to household tasks, hunting, gathering, agriculture, the fashioning of tradable items and the provision of marketable services. As pre-history transitioned into history tribal life was viable in that tribal social groupings could be self-sustaining allowing members of the tribe to participate, from the time of their birth, in a society which effectively - if unconsciously sought to offer protection to its members and to co-operate in the tasks necessary for communal survival. As time passed there were domestications of crops and herds, increased skill in the fabrication of artefacts such as clothing, bows and arrows, and storage pots. Very gradually peoples began to gain skills in copper, bronze and iron metallurgy. As yet more centuries rolled by city states proved to be increasingly viable. Storable surpluses of food were being harvested in farmed fields. Herds of domesticated livestock were maintained all year round. Artisans and traders could congregate in city states where local rulers, or ruling councils, could arrange for basic policing and, perhaps more importantly, for the defence of their city state. Trade could be widely engaged in by land and sea during times of peace. Populations could tend to increase as children born into what were often large families grew to adulthood and established families of their own. From time to time city states sought to exercise sway over their neighbours establishing local kingdoms and empires. It could well be that city states would find reason to enter into federations, or voluntarily accept the authority of a powerful neigbour, in attempts to achieve greater security from external threats or to facilitate trading relationships. Such a situation also featured the involuntary incorporation of city-states or federations of city-states into expansionary kingdoms or empires as a result of conquest. An empire based on a settlement called Rome eventually came to exercise control over immense territories. Rome's early expansions tended to come about as a result of prevailing in contests of arms with neighbouring states, or with regional rivals such as the Carthaginian Empire. Circa 218 BC a Carthaginian general named Hannibal Barca led a force some 100,000 strong, and featuring numerous cavalry and 37 war elephants, from southern Spain northwards with the intention of challenging the rising power of the Roman Republic. Whilst Hannibal's forces were reduced over time more than 20,000 men, together with a cavalry force and some elephants, were able to cross the Alps from Gaul (i.e. today's France) into the Italian peninsula where Hannibal's forces subsequently remained an active threat to Rome for some fifteen years. During these years Hannibal's forces won several key battles against Roman forces which were much more numerous and found allies amidst some of Rome's rivals in the Italian peninsula. It is recorded that Hannibal personally drove a spear into a gate of Rome which stood closed against the entry of his forces into that well-fortified city. Rome eventually defeated the Carthaginian Empire and absorbed its territories - which extended from much of North Africa into today's Spain and onto some of the major islands in the Mediterranean Sea. As the decades rolled by it came about that Rome, sometimes through the unauthorised [i.e. by the Roman Senate] activities of ambitious generals such as Julius Caesar, expanded its control very widely without any real provocation. Having questionably embarked on initially localised, and subsequently far-reaching, [unauthorised and rather brutal] conquests in Gaul after 58 BC Julius Caesar led his forces on an expedition to the (then remotely positioned and mysterious) island of Britannia in 55 BC. Across many thousands of years of history massively influential societal changes, (rather than adjustments in Human Nature? ), have transformed how human lives have been able to be lived. Tribal patterns of life were increasingly marginalised by city states which became centres of influence and of power. City states were incorporated into Kingdoms and Empires before which previously independent city states and tribal peoples had to yield up concessions. Imperial Rome rose to power but eventually went into a decline, surviving as a "Byzantine" empire centered on Constantinople but losing its western homeland of Italy, and nearby provinces such as Gaul, Britannia and Spain to the control of "Germanic" migrant peoples. These incomers were typically more martially accomplished than the "Roman provincials" whom they now overwhelmed. They also had relatively little heritage of administrative or technological accomplishment. They usually proved to be accepting of the Christian faith they found in western Europe, however, and looked to the church as an aid in administration and governance. Leading figures among their number laid claim to large landholdings. As further centuries rolled by these migrant-dominated provinces tended to adopt "feudal" patterns of kingship where lesser lords owed service-in-arms to greater lords and all owed service to the king. These times have been spoken of as being ones where "some men worked, some men fought, and some men prayed". That is to say a majority of persons worked as cultivators, herdsmen, artisans and traders, some men were lords and these were directly served by knights and men-at-arms, and many people embraced religious lives as (male or female) monastics or priests. It can surely be suggested that there may be "a Tripartism" discernible here. Our understandings of the perceived realities of lives lived in feudal-monarchical times are probably somewhat mis?-informed by TV and film. The England of Robin Hood and his Merrie Men featured a rivalry between a bad, usurping, King John and his older brother King Richard who had been captured in central Europe and held for [a King's?] ransom whilst returning from campaigning in the Holy Land. A grasping Sheriff of Nottingham, who was supportive of King John, is generally represented as overseeing a state of affairs where poorer persons experienced demands for the payment of taxation, leading in many cases to hunger and debt and to some desperate persons seeking refuge with an outlaw band in Sherwood Forest. The Central Europe of William Tell of such times has been presented as featuring a grasping and harsh Habsburg administrator named Gessler who is similarly generally represented as overseeing a state of affairs where a brave and resourceful Swiss commoner [William Tell] sought to stand up for the common people and to relieve distress which was often held to have been occasioned by the severe imposition of taxation. Kingdoms and Empires were dynastic and it was held that monarchical titles could be inherited by those who stood in line of succession due to their being "of royal blood". Dynasties sought security alliances, and other advantages, through arranging marriages-of-state between members of their respective families. Some of these arrangements were between persons who differed quite widely in age and were often entered into where one or both of the betrothed persons might be mere infants. It was not unknown for marriages to take place between closely-related cousins for dynastic purposes. Given the limited success that the medical science of the day had in combatting disease such arrangements often had the outcome of bringing disparate peoples under the sovereignty of those who actually survived to inherit sovereignty due to their being of royal blood associable with dynastic lines and claims to sovereignty. A most notable example of this being the truly immense territories that were regarded as being under the sovereignty of the Holy Roman Emperor Charles V who inherited sovereignty in certain Austrian, Swiss and Germanic territories from his male, Habsburg, ancestors, the Duchy of Burgundy (including Belgian, Dutch and French lands) from his paternal grandmother, and the Kingdoms of Aragon and Castile, together with "Spanish" claims on South America, from his maternal grandparents, Ferdinand of Aragon and Isabella of Castile. Charles V's mother, the Spanish princess Juana, had actually been a younger daughter of Ferdinand and Isabella, and there were several male siblings. Several early deaths and childlessness, however, resulted in the rights of succession to sovereignty settling on the children of Juana in her marriage to the Habsburg prince Phillip the Fair. Charles V, in his childhood and youth, was raised with a knowledge of languages suited to his inheriting sovereignty in what became his "Habsburg" and "Burgundian" domains. The inheritance of sovereignty in Aragon and Castile was so unexpected that he was not linguistically educated in ways fully appropriate to inheritance of sovereignty there. A marriage between Charles' son and heir Philip of Spain (28 years of age and a widower) and his cousin Mary of England, (38 years of age, unmarried, a reigning monarch and born as a daughter to King Henry VIII and Catherine of Aragon), offered to bring territories in the British Isles under Habsburg sovereignty - but this marriage proved childless - allowing a Princess Elizabeth to succeed to sovereignty as Elizabeth I. During these times Habsburg sovereignty in Europe became separated into "Spanish" and "Austrian" aspects with Ferdinand, a brother of Charles V, (who had married a Hungarian princess to whom Hungarian sovereign lands were held to pass after her own brother perished in battle), ruling extensive lands from Vienna and bearing the Holy Roman imperial title. Charles V supported this separation, (which actually involved the transfer of some Austrian and Bohemian lands over which he was held to be sovereign to Ferdinand), as he had come to view his own lands as being too extensive for any one individual to rule effectively. A King of France (after deliberately divorcing his Queen), and a series of presumptive successors to the French throne, married Anne, the heiress to the independently sovereign Duchy of Brittany, and her female descendants, in the hope of uniting Brittany dynastically with France and preventing Habsburg-dynastic claims arising in relation to Brittany through (an arranged) dynastic marriage and possible succession. The King of France who divorced his wife actually invaded Brittany, kidnapped the youthful Anne, and entered into a marriage with her despite her already being fully committed towards marriage with a Habsburg prince. Unlike the Duchy of Brittany the Kingdom of France did not allow for female succession. Such marriages-of-state, by Kings of France, (Anne was herself wife to two Kings of France during these dynastic processes! ), and presumptive successors to the French throne, eventually produced a male heir to both France and Brittany who went on to leave heirs to succeed him as kingly and ducal sovereign - this was singularly important to the French royal state in preventing possible Habsburg 'encirclement' of France. Brittany being located "to the west" on the Atlantic coast whilst extensive Habsburg territories lay to the east and north of France. As the decades and centuries followed their respective courses Feudal times became elaborated upon. Such developments gave rise to the France of the Ancien Regime where the King was theoretically an absolute ruler, where not all the nobility maintained the military traditions of earlier centuries, and where many powerful families sought to gain prominent positions in the church - and control of associated revenues and patronage - for certain candidates they favoured: often without much regard for any personal piety being evidenced on the part of the would-be Bishop or Abbot being sponsored. Well-paid and influential positions in the state administration or the army were more or less reserved for persons of noble birth. The majority of persons living in France lived out their lives as peasants, labourers or artisans. In the British case the would-be absolutist rule of the Stuart kings, after 1603, was challenged by those who sought the recognition of the authority of parliament. One Stuart king, (Charles I), was publicly beheaded, another, (James II), was allowed to flee into exile in 1688 such that a more constitutional form monarchy could be put in place. When a "Stuart" monarch expired in 1714, without direct heirs, the British establishment disregarded the valid "Royal Blood" claims to succession of more than fifty persons, who were deemed to be capable of attempting to undo the settlement reached in 1688 and re-establish the absolute authority of the Crown. Such thinking led to the recognition of a "Hanoverian" succession by a German-speaking Electress Sophia of Hanover who had more distant claims, based on her own dynastic ancestry, to the English throne. In the event, however, despite seeming relatively good health Sophia of Hanover predeceased Anne, the last "Stuart" monarch, such that her son succeeded to sovereignty as George I.
Voyages of Discovery, initially embarked upon under the patronage of the Portuguese Prince Henry "the Navigator" - were soon thereafter emulated by orders issued by the rulers of Spain. Such voyaging led, in time, to the establishment of global patterns of sea-borne trade and to widespread settlement by Europeans overseas. Although the practice of slavery had more or less died out in Europe some of the earlier Portuguese voyages of discovery had resulted in enslaved Human Beings being offered by local merchants and rulers on the west coast of Africa to the Portuguese explorers in trading negotiations. Such persons were subsequently "offered-for-sale" in a marketplace in Lisbon. It came about that Europeans attempting to exploit the territories they were settling in on the islands of the Caribbean and the coasts of North America often, and increasingly, resorted to practicing systems of cultivation based on slave labour to produce such high-value commodities as cane sugar and tobacco. Plantations were established for the production of raw cotton, through slave-labour, for the manufacture of cotton cloth. Human Nature may surely be seen as being relatively unchanging across time whilst the societal circumstances in which said Human Nature influenced the formation of Human Societies were being continually altered - to the point, over time, of being transformed. Britain and France were the two "superpowers" of the eighteenth century. They came to blows between 1756 and 1763 in a "Seven Years War". George Washington, who was serving as an officer in the Virginia militia, was involved in an incident on the frontiers of the "British" and "French" presences in the interior of North America in 1754 in the lead up to this period of widespread open conflict. This period of active hostility, known in North America as the French and Indian War, was actually contested widely across the globe and, alongside featuring many deaths and injuries, was financially very, very, expensive. The British, at a time when the British population was some ten million, and the population of European descent in the thirteen colonies of "British" North America, (in large part due to a notably high birth-rate), was more than two million, sought to impose taxations in the American Colonies to help meet the cost of defence. Many colonial Americans objected to such imposition of taxation - particularly if their views were not to be directly represented in the parliamentary proceedings in London. In the diplomatic exchanges sent between royal courts in those times it was standard practice for kings to address each other as being "brother monarchs". Nevertheless, the King of France was persuaded by his one of most important ministers, who had key responsibilities in relation to Foreign Affairs, that France should, given her on-going rivalry with Britain, send monetary and material aid to such colonial American "Patriots" even though they were, from a strictly "monarchical" point of view, "rebellious subjects" in open opposition to their "legitimate" monarch. An American Declaration of Independence was made in 1776, thousands of French soldiers were subsequently shipped to North America and served alongside American Patriot forces, and French naval power was extensively deployed, in a conflict which resulted in a British recognition of American Independence in 1783. France had found her participation in the Seven Years War to be expensive, had engaged in an extensive modernisation of her naval forces and provided substantial and notably costly aid the American Patriots - all of which led to a most burdensome accumulation of debt on the part of the French royal state. It so happened that crops and herds in France were adversely affected by extreme weather in the seventeen-eighties, very possibly as a result of extreme volcanic activity in Iceland. Such lessening of agricultural production raised food prices and depressed the ability of the French population to feed and clothe themselves let alone pay their taxes. A financial crisis ensued where the king eventually accepted the necessity of convening an Estates General - a body historically comprised of representatives of a First Estate of Churchmen, a Second Estate of Noblemen and a Third Estate of everyone else - (an everyone else who actually comprised some 98% of the population). No such an Estates General had been convened for more than one hundred years previously and this one was only being called to assemble because of the depth of the crisis in the finances of the kingdom. It was accepted by the Royal authority, that the upcoming Estates General would follow historical precedent in featuring voting "by Order" where each of the three historically recognised "Estates", Clerical, Noble and Commoner (or Third Estate), would consider issues separately and advise the king of the majority decisions reached within that Estate. The king seems to have expected that the Estates General, which convened in May 1789, would rubber-stamp increases in taxation to meet the financial crisis. Many Third Estate representatives hoped for, or even expected, some degree of political reform which would allow the broader population of France more of a voice in affairs. In the event the Nobility and higher Clergy proved to be reluctant to consent to such reforms preferring that the First and Second Estates should continue to be able to advise the king of the results of their own Estates' independent processes of deliberation as they saw necessary. In the lead-up to the selection of representatives to the Estates General the king had authorised the selection of about as many individual representatives on behalf of the Third Estate as would be selected to represent the First and Second Estates combined. From the initial convening of the Estates General in early May "Third Estate" representatives had declined to comply with official procedures of accreditation which were intended to lead-up to the various Estates meeting seperately and voting by Order. By mid-June most of the Third Estate representatives had accepted the idea that the traditional proceedings of an Estates General should be replaced by a National Assembly where all representatives would participate in voting jointly on issues "by head" in efforts to reach a majority decision. [It came about that the formation of such a National Assembly was reluctantly assented to by King Louis XVI after, given the impasse over such things as accreditation, most of the representatives of the "lower" clery, (who typically had "Third Estate" family backgrounds), and a number of "reform-inclined" nobles, (including the Marquis de Lafayette who had been prominent in the recent French involvement in North America), joined in with the Third Estate in supporting the formation of such an assembly]. The financial crisis continued, those who sought reforms considered that the king might suspend the Estates General / National Assembly and seek to impose his own measures - with the backing of the army. The situation moved towards more revolutionary change after Parisians stormed a fortress-prison known as the Bastille, and tore down a customs wall in Paris, (where taxes and duties were routinely imposed on key commodities such as salt entering the city), in July 1789. France was declared to be a Republic "One and indivisible". King Louis XVI was required to undertake to uphold a Constitution that had been devised in relation to the future governance of France. A French Revolutionary Era ensued in France and spread very widely across Europe. The sovereignty of the people was proclaimed in France and elections were held on the basis of adult males having voting rights. Before many years had passed, however, France became less revolutionary as relatively conservative "liberal-constitutional" interests gained power in relation to those which favoured revolution. France, and much of Europe, spent some fifteen years under the leadership of a successful general, who also showed political and administrative talents, named Napoleon Bonaparte. Britain, as the nineteenth century progressed and into the twentieth, has undergone slow processes of transformation towards being increasingly democratically representative. Defunct (because depopulated-over-time) historic parliamentary constituencies, known as "rotten boroughs" and which were under the decisive influence of local magnates, were abolished in the eighteen-thirties whilst new parliamentary constituencies were established in relation to a number of towns and cities which had appeared as a result of Britain's Industrial Revolution. Voting rights were extended more widely to property owners, then to adult males over a certain age. Said age limit was subsequently lowered and, after a determinedly pursued "Suffragette" campaign, voting rights were increasingly conceded to women. Even today, however, the British Parliamentary system features a politically authoritative "House of Commons" and a politically advisory "House of Lords". Whilst members of the House of Commons are elected the membership of the House of Lords is composed of a smallish number of Church of England bishops as "Lords Spiritual" together with a restricted number of "Lords Temporal / Peers of the Realm", (i.e. persons of Aristocratic Descent), and numerous notable achievers in various careers, professions and business who have been appointed as "Life Peers" with a view of benefitting parliamentary processes through their collective experience and expertise. The House of Lords had actually been an authoritative parliamentary chamber into the early twentieth century when the then King offered to create a large number of new peerages to ensure the passing of legislation favoured by a "Liberal" House of Commons that was being blocked by a conservatively-inclined House of Lords. The House of Commons subsequently explicitly asserted its primacy, over the House of Lords, in the consideration of financial matters. Such primacy was later extended beyond matters of finance and - whilst the House of Lords can attempt to suggest amendments to proposed legislation - it cannot ultimately block legislation passed by the House of Commons. to easily allow widespread literacy to develop. [Such widespread literacy as did develop tended towards showing that people generally preferred to become literate in terms of "their own" mother-tongues rather than in the Languages of State as previously upheld by the locally-ruling dynasties]. The circumstances in which people lived were slowly changing to the point of transformation. More and more people were becoming literate, populations began to increasingly press for a recognition of the sovereignty of the people, demands were made for recognition of hitherto dis-regarded languages which had had something of a marginalised existence in the functioning of this or that dynastic state within which linguistically disparate peoples had become incorporated over time. Fault lines opened up where a dynasty had ruled over disparate peoples due to inheritances of dynastic sovereignty and where newly assertive disparate peoples pressed for the establishment of sovereignty of the people to apply to themselves as a localised state or people. Given disparities in material prosperity, living and working conditions, and educational and economic opportunity, between rich and poor some persons began to voice socialistic aspirations seeking to improve material conditions in which poorer persons lived their lives. Initiative in sponsoring changes began to increasingly lie with aspirant peoples, [and Human Nature? ], rather than with established authorities such as dynastic houses, churchmen and aristocracies. Such politcal, economic and social currents as Liberalism, Constitutionalism, Capitalism, Socialism, Nationalism and aspirations towards full Democracy and the Sovereignty of the People increasingly challenged the traditional functioning of Europe's (hitherto) dynastic states. Transformative changes in society resulted in demands being made by peoples, who might be said to have - at this time in history - more socio-political-economic power than their forefathers, which resulted in absolutist kingdoms and empires being reconstituted, [in line with Human Nature? ], as constitutional monarchies or republics whilst break-away provinces or regions might seperately become constitutional kingdoms or republics. Thus over many decades Europe, and the far-flung "colonies" that had been widely established by Europeans, were open to successive changes which transformed absolutist kingdoms and empires into more localised constitutional monarchies and republics where peoples tended to migrate from countyside to town and where, increasingly, persons understood to be supportive of socialism were returned to democratic assembles. Said democratic assemblies also tending, in more recent times, to be supportive of efforts to facilitate economic activity in order to raise material living standards and to provide opportunities for gainful employment. Our attempt to better understand The Past and The Present has now arrived at the time of the French Revolution, at a time, indeed, which many historians would regard as being the time on the onset of "The Modern World". The Question that was asked earlier - Why is the World the way it is today? - will, it is hoped, be on the way to being answered by the above consideration of tribal, city-state, Roman imperial and feudal-monarchical modes of existence and the subsequent impact of transformative populisms such as Liberalism, Constitutionalisms, Nationalisms, Capitalism and Socialism. … The world exists for the education of each man. There is no age or state of society or mode of action in history, to which there is not somewhat corresponding in his life. Every thing tends in a wonderful manner to abbreviate itself and yield its own virtue to him. He should see that he can live all history in his own person. He must sit solidly at home, and not suffer himself to be bullied by kings or empires, but know that he is greater than all the geography and all the government of the world; he must transfer the point of view from which history is commonly read, from Rome and Athens and London to himself, and not deny his conviction that he is the court, and if England or Egypt have any thing to say to him, he will try the case; if not, let them for ever be silent. He must attain and maintain that lofty sight where facts yield their secret sense, and poetry and annals are alike. The instinct of the mind, the purpose of nature, betrays itself in the use we make of the signal narrations of history. Time dissipates to shining ether the solid angularity of facts. No anchor, no cable, no fences, avail to keep a fact a fact. Babylon, Troy, Tyre, Palestine, and even early Rome, are passing already into fiction. The Garden of Eden, the sun standing still in Gibeon, is poetry thenceforward to all nations. Who cares what the fact was, when we have made a constellation of it to hang in heaven an immortal sign? London and Paris and New York must go the same way. "What is History," said Napoleon, "but a fable agreed upon?" This life of ours is stuck round with Egypt, Greece, Gaul, England, War, Colonization, Church, Court, and Commerce, as with so many flowers and wild ornaments grave and gay. I will not make more account of them. I believe in Eternity. I can find Greece, Asia, Italy, Spain, and the Islands, -- the genius and creative principle of each and of all eras in my own mind. Some suggestions have now been made as to how it has come about that Human Beings - across historic time - have lived in tribes, city states, feudal monarchies, dynastic empires and kingdoms, and - more recently - constitutional monarchies and republics. The post WW2 Cold War between would-be liberal democracies and would-be communist states. NATO and the Warsaw Pact. Western Europe post WW2. An Iron and Steel Community transitions into becoming a European Economic Community and then a European Union. Reflections on such variously transformative, tragic, and even catastrophic, WORLDLY OCCURENCES now follow, (after some further historical background), in an effort to suggest that such potential invalidation, in terms or relevance, does not, in fact, overwhelmingly operate. The following two maps show something of the significantly transformative changes in the Political Map of Europe between 1815 and 2015. The territorial adjustments to the Political Map of Europe 1815-2015 cannot sufficiently depict other, and far-reaching, transformations in socio-economic terms during these two centuries! Such socio-political-economic "IMS"s as Romanticism, Liberalism, Constitutionalism, Nationalism, Capitalism and Socialism were largely unknown in much of Europe prior to those times when popular aspirations could be of sufficient power to challenge the established sway of Dynastic Rulers, Churchmen and Aristocracies. By 1848, however, circumstances were such in several European states as to allow for such challenges to strongly appear in the affairs of the day. Widespread instances of populist political (i.e. variously liberal, constitutional, national, and socialistic) agitation across much of Europe in 1848 unmistakably revealed the presence of the potential that public opinion was coming to have to challenge the traditional dynastically-sponsored social order that had been re-established after the French Revolutionary and Napoleonic Wars of 1789-1815. France itself had, (in line with the expectations of those foreign powers that had poured resources into fighting against Napoleonic France), reluctantly featured such re-establishment of monarchical tradition - with a younger brother of King Louis XVI assuming the throne as Louis XVIII, deeming Louis XVI's son, who had died whilst being held in confinement and undergoing revolutionary indoctrination, to have been effectively King Louis XVII. That is to say to understand "The Human Condition" in a nineteenth-century Europe where a range of "Populisms", (including Liberalism, Constitutionalism and Nationalism), had come to have the inherent potency to testingly challenge the orderings of civil society, and the ordering of dynastic statehood, that had been maintained by the Kings and Emperors who had been the holders of Sovereignty in Europe. Whilst many aspirational groups sought that changes would be conceded by their rulers it proved to be the case that such aspirational groups often proposed changes that were unwelcome to other aspirational groups. There were demands for some limited constitutional liberalisation and others for fuller democracy and popular sovereignty. Some groups seeking concessions to their aspirant nationhood were not willing to award concessions to potential minorities who would be living within the frontiers of said aspirant groups proposed national-sovereign territory. There were instances of (often materially poor and socially radical) urban aspirant groups seeking socialistic concessions which (often materially poor and socially conservative) rural-dwellers found it difficult to sympathise. … Many of the revolutionaries, especially in the German Confederation and Italy, wanted to transform their homeland into a strong and united country, but their aims contradicted the nationalist aspirations of minority groups. Some instances of social and political extremism allow previously "pro-reform" liberal elements to join with relatively conservative elements in supporting the return of traditional authority. Such nationalities living within the Habsburg Empire as the Czechs, Croats, Slovaks, Serbs and Romanians, find it more credible to look to the Emperor, rather than to the democratised assemblies recently established in Vienna and in Budapest as a result of populist agitation, for the future protection of their nationality. The Austrian Emperor and many Kings and Dukes regained political powers. Louis Napoleon, (a nephew of Napoleon Bonaparte), was elected as President in France after seeming to offer social stability in the future. Louis Napoleon later became the French Emperor Napoleon III, (as he deemed his cousin, a son of a political-dynastic marriage between Napoleon Bonaparte and an Habsburg Archduchess who had died of natural causes as a very young man, to have been Napoleon II). The dynastic House of Savoy was restored to sovereignty in Piedmont, Nice, and Savoy, and was given control of Genoa (putting an end to the brief proclamation of a restored Republic of Genoa). The Bourbon Ferdinand IV, King of Sicily, was restored to control of the Kingdom of Naples, but only after Joachim Murat, the king installed by Napoleon Bonaparte, rose up and supported Napoleon in the Hundred Days prior to the Battle of Waterloo, after Napoleon's return from a brief period of exile on the Island of Elba which had followed on from earlier military reverses. Ferdinand IV reassumed control of his former realms under the new title of Ferdinand I, King of the Two Sicilies. The Austrian Emperor gained direct control of the rich provinces of Lombardy and Venetia in the north of the Italian Peninsula. The former Venetian Republic had been abolished by Napoleon in 1797. Lombardy at this time was largely composed of the former Duchy of Milan, and the former Duchy of Mantua. The "States of the Church" were placed under the direct rule of the papacy and restored to their former extent - with the exception of the small "enclave" territories of Avignon and the Comtat Venaissin, which were to remain part of France. The Grand Duchy of Tuscany was returned to the control of a junior "Habsburg-Lorraine" branch of the Hapsburgs. The Duchy of Modena was returned to the control of a junior "Habsburg-Este" branch of the Hapsburgs. Marie Louise had been born a daughter of an Austrian Emperor. As an Austrian Archduchess, in her later teenage years, she had entered into marriage with Napoleon Bonaparte for political and dynastic reasons. A marriage ceremony took place "by proxy" before she left Austria for France with an uncle, who had actually previously commanded Austrian armies campaigning against those of Napoleonic France, standing-in for Napoleon during the proceedings. A son born of this union was awarded the title "King of Rome" by Napoleon and was regarded by him as his heir presumptive. In the event Napoleon's downfall led to this child being raised as a young Habsburg "Duke of Reichstadt". Over the following years Cavour, as chief minister to the dynastic House of Savoy (Kings of Sardinia), found it possible to gain popular liberal-constitutional-national support in the Italian peninsula. This support actually carried Cavour's policy further than the establishment of a "northern Italian" kingdom, (after winning the notably rich provinces of Lombardy and Venetia from a locally much disliked Austrian control), that he himself seems to have initially intended. The Kingdom of Sardinia-Piedmont, where Cavour had been chief minister, became foundational to an emergent "perceivable of as being relatively progressive" Kingdom of Italy (1860-1) at the expense of several other dynastic states in the Italian peninsula which were seen, by liberal-constitutional-national opinion, as being "unprogressive". Germanic Europe featured a number of sovereign states. 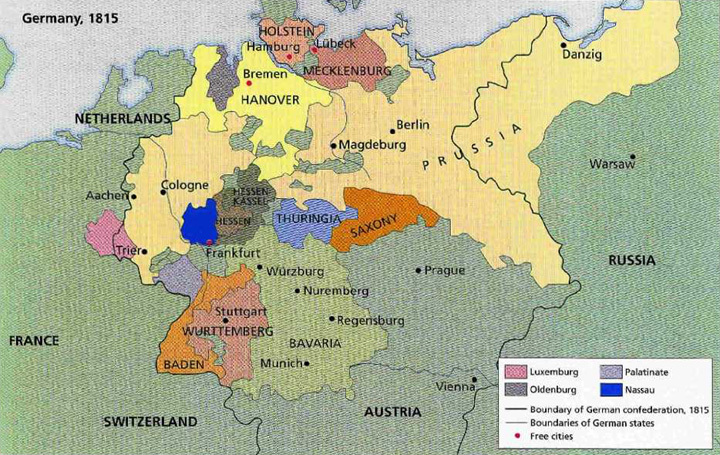 In the German lands, Bismarck as chief minister to the dynastic House of Hohenzollern, was similarly able to secure predominance, with local popular liberal-constitutional-national support, for the Kingdom of Prussia as being foundational to a "perceivable of as being relatively progressive" German Empire (1870) - at the expense of several of the other dynastic states of Germany and, notably, of the Austrian Empire. Appointed to high political office in Prussia by King Wilhelm I, at a time of crisis between (semi-absolutist) Monarchy and (emergent but limited) Democracy, Bismarck had reason to accept that "populist inspired" change was likely to be popularly insisted upon in the German lands and, given the example recently provided by Cavour and Sardinia-Piedmont, opted to attempt to guide such change into developments towards Prussian-led fulfilment of popular German-national aspirations in ways that would not be unduly damaging to the socially conservative traditions of the Kingdom of Prussia. 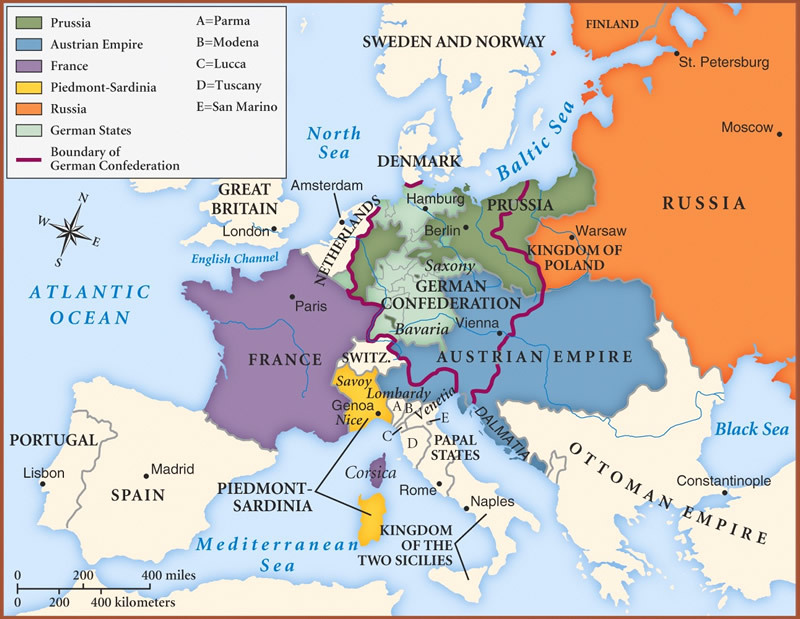 The consequences of quite widespread conflicts associated with the Unification of Germany, as sponsored by Bismarck, included a weakened Austrian Empire being subsequently reconstituted as an Austro-Hungarian "Dual Monarchy" in 1867 and that the protection that France had been offering to the Papal States, against encroachments by the Kingdom of Italy, was withdrawn. The Kingdom of Italy forcibly seized the Papal States in 1870, (despite strong protests by the then Pope), and made the historic city of Rome its capital. [Strains in relations between "Italy" and the Papacy were largely smoothed over in 1929 when the establishment an independently sovereign Vatican City State was formally recognised]. In order to attempt to feel secure - after the "Unifications" which had recently occurred of Italy and Germany - the Great Powers of Europe gradually aligned themselves in two blocs: a Triple Alliance [Imperial Germany, the Austro-Hungarian Monarchy and Italy] and a Triple Entente [France, Russia and Britain] in the hopes of arriving at an international security related Balance of Power. The Ottoman Empire had fallen into a period of decline where it proved possible for "European oriented" peoples living close to, or within, its frontiers to aspire to acquire territories as the Ottoman Empire continued to decline, or to break away from Ottoman control. In 1908 the Austro-Hungarian Monarchy irregularly laid claim to the Ottoman province of Bosnia-Herzegovina, (which it had been administering with Ottoman consent since 1878), to prevent its being reclaimed by "Young Turks" who had managed to assume governing powers in the Ottoman state - and who had a modernising agenda. This irregular seizure was denounced by several long established and powerful European states and was particularly protested at by Serbian and other South Slav nationalists, who themselves considered that Bosnia-Herzegovina might, in time, have been open to acquisition by themselves. Imperial Germany, however, firmly stood in support of the Austro-Hungarian move to claim Bosnia-Herzegovina. In 1914 the heir to the Austro-Hungarian Imperial and Royal titles was assassinated, together with his wife, in Sarajevo the capital of Bosnia-Herzegovina by a teenage Serbian nationalist. Several weeks later Austro-Hungary, alleging that Serbian officials assisted the recent assassinations in Sarajevo, opted to declare war on the Kingdom of Serbia. Imperial Russia, in large part responding to pro-Serbian public opinion in Russia, opted to seek to defend "Slavic", "Orthodox Christian", Serbia against such actions. Russian planning for war accepted that a conflict might arise with the "Triple Alliance" and active Russian mobilisation against Austria-Hungary was accompanied by such mobilisation of forces to face Germany as was envisaged by the overall Russian planning for engaging in hostilities with the Triple Alliance. Despite Russian assurances that this mobilisation against Germany was only precautionary the German authorities themselves opted to enact their own plans for conflict with the "Triple Entente" which envisaged an invasion, and defeat, of France to be followed by a longer campaign against Russia. Thus the German and Austro-Hungarian aspects of the Triple Alliance came to be in open conflict with the Russian and French aspects of the Triple Entente. Other states subsequently became embroiled in what became known as the Great War or First World War. Britain protested a German decision to seek to invade France via neutral Belgium and opted to attempt to defend France and restore Belgium - several territories overseas which had close ancestral and historic links with Britain opted to lend their support to Britain. The circumstances at the outbreak of these hostilities were not such as to require the Kingdom of Italy, despite being a member of the Triple Alliance, to immediately itself engage in the conflict. Before many months had passed the Kingdom of Italy was prevailed upon, through diplomacy, to align itself with the Entente powers and against the Austro-Hungarian and Imperial German "Central Powers". As the conflict continued expensively of life, limb, and treasure, peoples often tended to blame pre-war elites more than anyone else for the onset of the horrendous ongoing conflict. German interests saw great advantage as being possible from supporting the transportation of the influential Communist revolutionary, Lenin, from Switzerland - where he had been living in exile - to Russia where his ideological message might prove attractive to a disenchanted populace such that the Russian war effort would be weakened. The Tsar, and the Russian "establishment" supported Russia's continued participation in what was proving to be a war that featured grievious losses of life and limb and much privation amongst the civilian population. Lenin seemed to offer "Peace, Bread and Land" to the Russian people. In 1917 revolutions occured in Russia such that Russia effectively withdrew from the war allowing the Germany and Austro-Hungary to concentrate their forces against France, Britain and the United States of America, [which had entered the conflict in association with the French and British]. Despite this Germany, and her allies, came to recognise that the French, British and Americans were going to prevail. A suspension of hostilities was arranged for November 11, 1918. 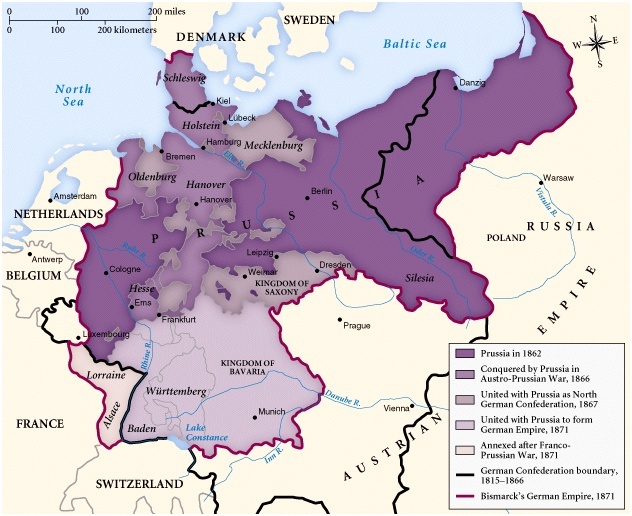 The Allied and Associated Powers required that the German Emperor go into exile and that Germany explicitly accept responsibility for the onset of the First World War. It was accepted that peoples should enjoy rights of "self-determination" as to which sovereignty they would live under in the future. It was anticipated that such processess of "National Self-determination" could well lead to the establishment of states, (often after emerging out of existing dynastic state structures), with frontiers determined along "lines of nationality" and that there could well be resulting "National Minorities" to which it would be right and proper to offer credible assurances of a protected status within such newly "Self-determined" states. In the hope of greatly lessening the possibility of the outbreak of ruinous widespread wars in the future efforts would made to replace "Balance of Power" arrangements with "Collective Security" arrangements overseen by a "League of Nations". The Habsburg ruler of Austria-Hungary abdicated his throne and it was accepted that the several constituent peoples of Austria-Hungary could establish localised states based on such self-determination. The French and British attempted to aid right-leaning "white" Russians such that the Russian "Bolsheviks", led by Lenin and others, would be deprived of power. Whilst there had been an accumulation of aspirations towards change prior to the outbreak of hostilities in 1914 the societal transformations that occured during the Great War resulted in the onset of new circumstances in which Human lives were to be lived. Relatively static societies where there was little geographic or social mobility and where people lived under dynastically sponsored languages of state were transforming into relatively mobile societies where there could well be geographic and social mobility where numerous "national" languages were being upheld within locally "Self-determined" states. Leftist political aspirations stood to gain support through alterations in public opinion and through support coming from such states as Russia. Persons living their adult lives after 1918 found themselves as individuals, and as societies composed of individuals, having to address the implications of nationalistic, linguistic, territorial and socialistic aspirations being expressed which could not as readily be expressed before 1914. In the aftermath of the recent ruinous wars, and the demobilisation of millions of persons who hads been serving as soldiers, economic recovery did not soon follow. There was mass unemployment and a "Red" Russian-backed Communist International, or Comintern, sought to aid hard-line socialists in other European states in gaining political power in those states. It was in these circumstances that Benito Mussolini led a strongly anti-leftist "Fascist" movement in Italy such that he was enabled to attain a firm hold on power in Italy. Runaway speculation in stocks and shares in the United States was followed by a "Great Crash" which ruined many over-committed speculators, and also brought down many banks, such that even non-speculators were gravely affected. The purchasing power of the American public was dramatically curtailed. Whilst Germany had been attempting to meet steep reparations payments that had been imposed on the German state as an outcome of the recent Great War the Great Crash brought about mass unemployment in Germany, and her export industries, and sharpened the rivalry between leftism and rightism in Germany. It was in such circumstances that an increasing number of persons looked to Adolf Hitler's National Socialist German Worker's Party as offering a credible alternative programme of government. Amongst his policies Hitler proposed that it was desirable that Germany should forcibly seize "living space" for Germans "in the East". In 1939 Hitler entered into an Non-Agression Pact agreement with Stalin's Russia which allowed him a better opportunity to seize lands from the post WW1 Polish state. A Second World War ensued; one of the enduring outcomes of which was that, as Stalin's Russia eventually sent armies into several Eastern European states as Russia continued to engage, (following a German invasion of Russia of 1941), with retreating German forces, several formerly independent [post WW1] central and eastern European states were brought under communist ideological tutelage and under direct Russian influence. As the conflict continued America and other powers encouraged the establishment of an "United Nations Organisation" which it was hoped would prove more successful in its involvements in international relations than the League of Nations had been. In the hope of encouraging a stable transition of the economic activity of the several states that had been involved in the Second World War the Americans agreed to provide substantial financial aid to such transitioning economies under the so-called Marshall Plan. Such aid was taken up by several western European states whilst Russia, and those states which were under its influence, did not seek to accept such assistance. After the agreement of a cessation of active hostilities between the previously contending powers in Europe an "Easter Bloc" supported by Stalin's Russian was in being. Before long a "Cold War" rivalry between a Russian-led grouping of would-be communist states, and an American-led grouping of would-be relatively liberal and capitalist states, ensued. This rivalry featured two competing systems of alliance - a western North Atlantic Treaty Organisation [NATO] - and an eastern Warsaw Pact. Such rivalry was entered into widely across the globe with each power bloc seeking to weaken and contain the other. In these circumstances the eastern bloc and aligned states, from time to time, found it possible to send aid to would-be "liberation" movements in former, but lapsing, European colonies, and in doing so hope to gain ideological fulfilment and strategic and political advantage. In Western Europe post WW2 an Iron and Steel Community was devised, largely with the intention of helping to prevent future wars through an integration of key industries. This Iron and Steel Community was built upon and transitioned into becoming a European Economic Community and then a European Union. Whilst such dramatic political transformations were taking place other far-reaching transformations resulted in growths in populations, in trade and industry, and in urbanisation. The sciences gained more credibility and religious faith was compromised for many by the emergence of the Theory of Evolution of Species attributable to Charles Darwin and Alfred Russel Wallace. Thus descendants of Human Beings who, in earlier times had lived out their lives in tribes, city states, dynastic states and empires etc. found themselves experiencing rather different modes of existence whilst still being personally individually endowed with an innate Human Nature which, in all probability, was not so very different from the innate Human Nature with which their ancestors had been similarly personally endowed. Circumstances had changed transforming, and delimiting, the range of possibilities as to how Human Lives could, and would, be lived. Political parties seeking to win democratic elections in westernised states have found it particularly necessary to be deemed to be offering economic prosperity, and employment opportunities, to their electorates. Human Existence has been transformed by rapid economic development, much of this taking place in previously un-industrialised regions of the World. Across the Globe governments have tended to favour Economic Development and populations have tended to accept that salaries and wages will be earnt through employment in trades and industries. Towns and cities have expanded, resources have been harvested from fields and mines to be utilised in feeding people and farm animals and in supporting Economic activity. Such activity has been conducted on such a scale as to produce substantial amounts of waste products arising from manufacturing processes, wear and tear, and Human consumption and eventual disposal. Processes of democratisation, of fragmentation of Monarchies and Empires, and decolonisation, together with a need for labour and for key skills after the Second World War, have resulted in situations which led to flows of migration into many western states such that they have become increasingly multi-cultural and multi-religious. This tendency being added to by the recruitment of skilled persons from outside "the West" to support economic activity in Europe and America, and by the influx of persons seeking refuge from diverse threats arising in troubled regions of the World. In this regard it may be of great benefit to actually show that the Spiritualities that are to be found in Buddhism, Christianity, Islam, Judaism, Sikhism, Taoism and Vedanta-Hinduism are highly similar. It can surely be hoped that such realisation would allow host communities to view economic migrants and refugees with more acceptance and respect and allow economic migrants and refugees to view the communities in which they now live their lives with more acceptance and respect. Other pages on this site feature content which tend to demonstrate that the Spiritualities found at the heart of each of the Religions of the World actually shows remarkably close similarities across the Faith Traditions of Mankind. "Men make their own history, but they do it under circumstances directly found, given and transmitted from the past." "I believe that the more you know about the past, the better you are prepared for the future." It is difficult to know what is around the corner. If we take the Internet and economic globalisation as examples - the ways in which people shop, in which goods are distributed, and where goods and merchandise are actually produced have been dramatically transformed - and that within less than fifty years! "Civilization is a stream with banks. The stream is sometimes filled with blood from people killing, stealing, shouting and doing things historians usually record; while on the banks, unnoticed, people build homes, make love, raise children, sing songs, write poetry and even whittle statues. The story of civilization is the story of what happened on the banks. Historians are pessimists because they ignore the banks of the river." That being said there do seem to be very real challenges which Humanity will have to cope with such as climate change [which may yet seriously affect food production and thus tend to displace populations], global population growth, exhaustion of [hitheto] key resources such as oil and problems of pollution.
" … it isn't exactly political correctness that dogs history; it's more a pernicious refusal to enter imaginatively the lives of our ancestors. Great and good men and women stirred sugar into their coffee knowing that it had been picked by slaves. Kind, good ancestors of all of us never questioned hangings, burnings, tortures, inequality, suffering and injustice that today revolt us. If we dare to presume to damn them with our fleeting ideas of morality, then we risk damnation from our descendants for whatever it is that we are doing that future history will judge as intolerable and wicked: eating meat, driving cars, appearing on TV, visiting zoos, who knows?"